Django has been the backbone of many modern web applications that we see today. Growing tremendously over the past decade, Django is a popular framework and provides a great level of stability and performance. HackerEarth is conducting a hackathon (Djangothon) dedicated to Django and its passionate community to explore this widely used framework. 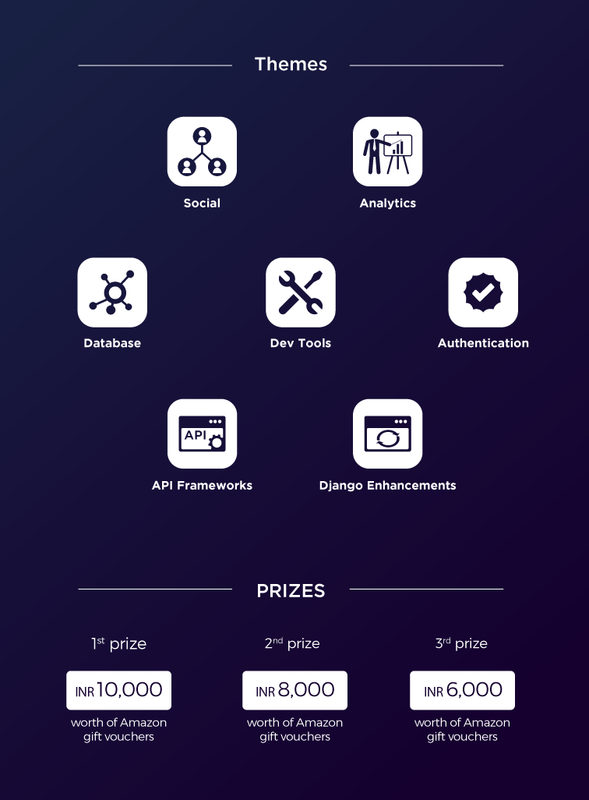 We are inviting passionate Python/Django developers to take part in this hackathon and contribute towards Django by building new packages and hacking on its core modules. Second phase : Offline hackathon - Hack on your idea and build the app in a 24-hour hackathon in the offline phase which will take place on 17th September, 2016 at HackerEarth office. This theme would include apps for site analytics, applications metrics, performance measurement, business intelligence metrics, page load time, etc. which can be integrated out of the box with any Django site. Packages that improve existing database engines like MySQL, Postgres, MongoDB or packages that support other databases like Cassandra, RethinkDB, HBase etc. come under this theme. Apps that help you to collect insights and metrics on top of the database engine for e.g., number of queries/sec, the average time taken to execute the queries, etc. can also be built. A great example of an existing dev tool is the django-extensions package. Apps can be built to help debug and log errors faster, improve native run server, etc. The options in this category are endless and it all depends on building an app for the problem you always faced while writing code in Django. Can you roll out the simplest & cleanest package to allow users to login in a Django site? It can support captcha, throttling or other common things to build a robust authentication system. Again there are a lot of improvements that can be done in existing packages like Django-allauth or a clean new package can be written from scratch. Fed up of all the existing API creation frameworks written in Django? Want to roll out one of your own or improve an existing framework like DRF? You are free to play around, after all it's your battleground. This is a wide category including fields, forms, mixins, templates, or any other core Django component where you would like to see enhancements to make the application development better and simpler. You can roll out your own field type, forms, editor, etc. which works out of the box with any Django application.